One of the best ways to improve your probability of winning while trading is by learning from your own trading history. Like they say, ”those who forget the history, are most likely going to repeat it”, a mistake often committed by traders. This could be either because of no access to tools/technology or not knowing the importance of learning from your past. We at Zerodha understand this, and that’s why we’re launching Quant, a financial behavioural analysis and visualisation tool. Q, our new backoffice, is a very intuitive reporting tool, but it’s mostly for contract notes, P&L statements, Trade/Order Books. Quant ups the ante and crunches your trading history and extracts useful insights for you to learn. Quant, as the name suggests, will help you perform quantitative analysis of your trading past and also introduce you to a sabermetric approach to trading. Quant algos will go back in your trading history and intuitively depict things like, what was your trading size at which you made most profits, any pattern with time in terms of your profitability, did you make profit by trading with the trend or against, your most profitable scrips, and a lot more. 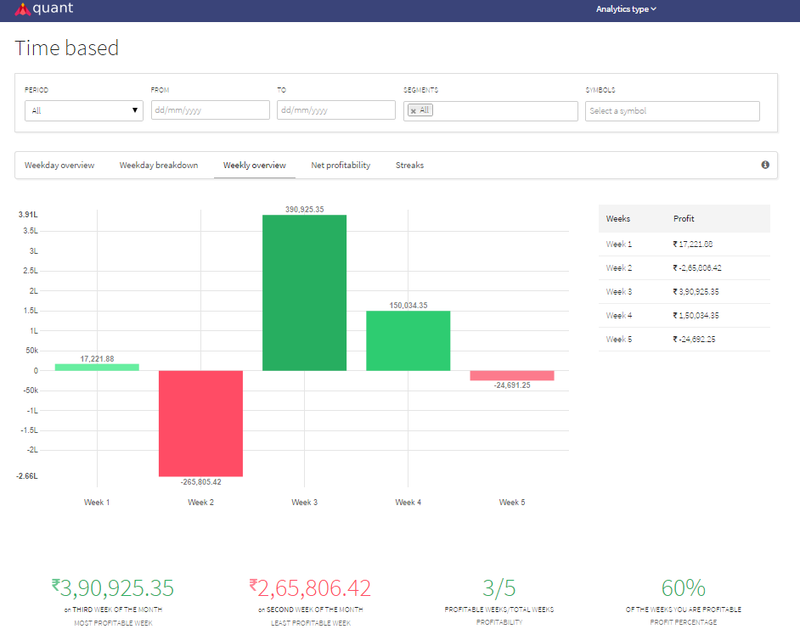 The first release of Quant will comprise of “Time based analytics” to help spot any trends in terms of your profitability based on when you trade, and “Portfolio Equity Curve” to help measure your stock holding performance against the benchmark (Nifty). Do note that all the figures are on gross basis (excluding brokerage and other costs). You can start off either visiting http://quant.zerodha.com/ or by clicking on Quant when logged into Q. Tells you the best weekday for you in terms of gross profits made. You can either use the periods available already or mention a custom date range. For instance, you can see that this particular account has taken the biggest hit on a Tuesday. The segment and symbol box will help you further refine to view the same analytics for a particular segment or symbol that you have traded. Shows your best weekday in terms of gross profitable weekdays to total number of weekdays traded. This will also help you figure out your chances of winning on expiry days while trading Equity derivatives and Currency. The green line indicates the week whereas the rest are days. Clicking on each of the days will add on to the scatter plot to help you better visualize the number of times you have traded on a particular weekday and how many of those have been winners. As you can see above that this client has been most profitable on Expiry days and Fridays, with an almost 75% probability of winning. You can use the smaller graph below to zoom in or out of a particular time period. Similar to weekday overview, this will help you figure out which part of the month you are most profitable, 4th and 5th week being the last weeks of the month. This particular client has been most profitable during the 3rd and 4th weeks of the month while the second week being the worst. 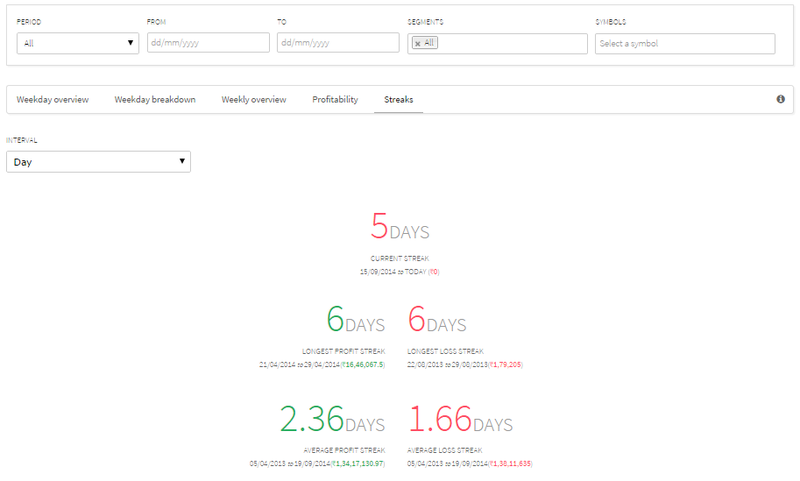 Shows you what has been your maximum consecutive profit or loss making days. You will be also able to see your current and average winning/losing streaks. The above reports may not match to your normal P&L because the profitability is calculated per day and not for a time period in your normal P&L statements. The equity curve helps you measure the performance of your stock portfolio versus the benchmark (Nifty Index). You will be able to plot how Rs 100 invested in your portfolio would have performed as compared to Nifty. See the below equity curve for one of our clients and how he has outperformed the Nifty. Time based analytics should help you better manage positions, reduce your trading size on time periods where you have historically not performed well and increase when you have. Equity Curve will help you measure the true performance of your holdings. Yes 30% in a year is good, but not if the benchmark was up 60%. The quest from when we started Zerodha has been to give our traders an edge over others while trading the markets. Be it lower costs, a good trading platform (Pi), reporting (Q), trading tools, initiatives like 60 day challenge or now Quant. Quant is the first of its kind tool offered to retail trading community, not just in India but across the world. This is just a start, and we will add a lot more in the next few releases for you to be able to figure out where exactly you can improve to help increase your odds of winning while trading. And of course, needless to say, Quant is absolutely FREE to all Zerodha clients. Do help spread the goodness. If you’re a client, you can use the associate program. Congrations Nithin once again on this new tool… BI is the name of the game and quants will provide us with huge deal of information which was tacit till today. There is a sync button that you need to click on. I am getting this checked for your account. i know.. problem solved immediately , thank you…!! Can you send this to [email protected] with your client ID. Sync button is not working in quant. I tried it for time based analysis, however it does not provide latest data. Can you send email to [email protected] with your client ID. When we will be getting new quant? Sync button is not working. It’s not a good idea to stop supporting running version until you release a new one. Quant will be down as we are working towards building our in-house back office, Crux. Will take some time. Hello! We’ve currently deprecated Quant as we are working towards bringing the next version of Quant in our new backoffice. We will not be able to sync your data any further and apologize about the inconvenience caused. Thank you for your patience!.” how much time will it take to upgrade an year? We are working on a completely new Q/Quant, so it might take a couple of months more for this. The earlier version of Quant unfortunately couldn’t scale up the way we wanted (since it involves a lot of calculations on the fly). We are fixing this issue in the new release, you will have a lot more visualizations than before. Nithin .. QQ on PI … are going to have Fibonacci extensions too or just retracements? There are Fibonacci- (arcs, retracements, fan and time zones). But we can definitely add if any popular charting tools are missing in the future. Hi Nithin, Are there any plans of adding ADX & Ichimoku indicators on the Nest or nextgen tool Pi? On Pi, but once we have the final release out. 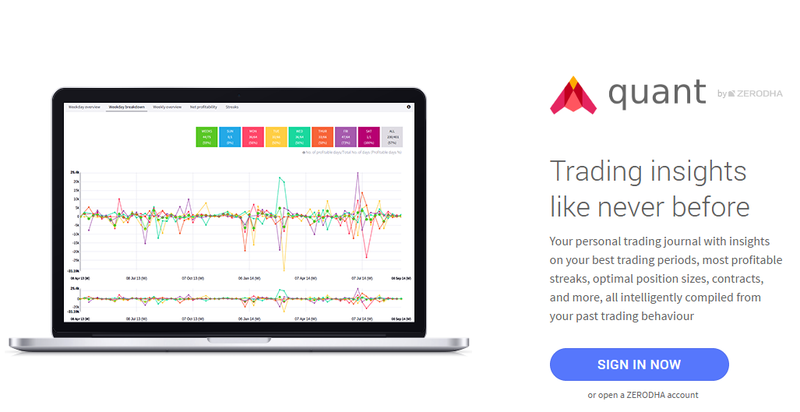 Given that most of them are beginning out trading via Zerodha (courtesy, the new platform, brokerage, pretty good customer service), Is there a way to import several years of trading history from other brokers, say by means of csv or excel or any other means to get a jump start on this Quant Tool. I believe that would really make sense. Imagine, someone who really started out with zerodha will have little or no history and would take a while to build enough history to make any sense out of this tool. Pls throw some light on this thought! Yep, we have already thought about it and working out on a way to import trades from other brokers as well. The equity curve already works, even if you had bought stock with another broker. When you transfer the stocks to Zerodha demat, Q will show up a discrepant quantity page where you can mention the price and date of acquisition which will be used to plot the equity curve. Thats cool to hear. Even a mechanism to manually feed in the transaction history by a data entry page would really help. This is all a right foot in the right direction.! hi Nitin , I have already client of Zerodha, I cant able to see above mentioned reports..I am mainly doing EQ….client id RJ0464…….Any restriction ? Can you check now, it should be up and running. My figures don’t stack up right with the quant. My user ID is RP0910 and I suffered losses in MAR 2014 while the Quant shows profit for this month. I believe time periods start at the first day of the month for all the months. Also, the equity curve doesn’t seem to take leverage into account for calculating the return. Also, the case with streaks. They don’t match my longest winning streak which is 12 days. The losing streak of 8 matches but the dates differ. If required, I could send my data in the required format to the tech team. Its a awesome tool but only thing is equity curve is not ploting properly. I think the confusion is because of the date range, should be fixed by tomorrow. Thanks for developing this tool and some interesting analysis. Can you provide similar analysis wrt leverage? I want to see historically how have I fared when I’m leveraged heavily vs a lightly leveraged scenario. I know that I tend to leverage heavily and then give away a big portion of my gains. I thank you and your team for this initiative. This is going to be a great tool for all. I would also request you to consider having trading app for IOS devices as you have one for android. This is one thing missing since long time. Trading in nest web application in small screen is really difficult. Please suggest if there is other way available for time being. Is there any mobile version of NEST web application available? I checked with your front office and came to know that there is an app !!! Exploring it. Thanks a lot..
excellent …eagerly waiting for the new platform. I have been trading with Zerodha since 2011, How do I see the same analytics for all previous financial years? Akbar, for now the data that is synced is only from April 2013, we are trying to get the older data on as well. Really nice feature to have. Congrats Zerodha 🙂 BTW, I had requested for a feature showing my total turnover for the period. But, there seems to have been no response for the ticket that was opened. @ Nithin – You had mentioned in simple taxation discussion forum that Tax P&L would be enabled for 2015 as way to look up for the turnover. But, as of now it has not been enabled. So, is there any other way to know my turnover. Yes we will have the tax P&L for this financial year enabled asap. Great work on quant – I’m finding out all sorts of strange things about my trading record. (I literally suffer from statistically significant Monday morning blues, for example). However, the reflection of my record seems wildly inaccurate on days when I carry an overnight (options?) position. I can’t quite figure out how it’s treating it – whether it’s failing to mark-to-market or what, but for instance when I try to pull up the daily profitability record, there are several days where the daily profit figure doesn’t correspond with the figure in the trading P&L section. These appear to be days where I was carrying an overnight options position. It would be great if you could rectify this – so that I can figure out whether my Monday morning blues are real, or not!! @Nitin… Congratulations on Zerodha and all the new initiatives you have been providing for making traders life more easier. I had prepared an excel file and Have been using it from long time now, where i manually put in the data and do similar kind of statistical analysis. I am also happy that we have something in common that we are both from BIT. Wishing you all the success …!!! Hi. This is Phani. I am going through Quant. But it is showing “data not available”. Could u please check that? Phani, we are making a few fixes, give it a couple of days it will be fixed. Hands down. Great effort. What a way to amaze the kids. Seriously, asserting this so called “Quantitative Analysis tool” (Which is nothing but a bunch of graphs reflecting what a bank statement would do) as a way to improve your trading pattern or strategy, is laughable. And that too from a broker who calls himself “modern” gives me hints about the desperate-to-market strategies of yours. 1. Your weekday strategy: Useless. Give me one reason that figuring out which day of the week has been most profitable to in last couple of months would increase my profit. Is it like that the God has assigned each one of us a “lucky weekday” trading on which we can earn bundles of cash? There is absolutely no relation between the day of week and the movement of any stock or commodity or currency prices. 2. Week of month strategy: Again Useless in the similar way. Copy my comments from above. 3. Profitability: Essentially same as the trading history with profits and losses. At least not completely useless. 4. Equity curve: Not an out-of-the-box offering but at least this reflects something. One get to know how he traded, can set a benchmark to rate future trading performances. But nothing that can improve his trading skills or help him earn more money. Its like Batting average of a Batsman, people can judge him(or have a good time killing discussion over it) with that number but knowing it won’t help him to refine his performances. Its just a bundle of figures, that’s it. 5. Streaks: Although it also doesn’t offer anything which could make traders earn more, but it may help them know about their trading style(which can make them wonder about figures which are essentially of no use but merely a topic of discussions). You baffle me when you assert things as you’ve done in your first paragraph. Anyways, impressive initiative. Good Luck with your sales! Hey Suresh, 🙂 thanks and appreciate your feedback. This is just Quant starting off, ideally we should have launched once all the reports were ready. But we were spotting trends that we thought could help our clients. But in the next couple of months you will see reports like how you performed based on your trading size, how you performed while going with the trend and against the trend, how you performed based on the stop/target you used, and a lot more. Do let us know, if there is anything that you would like to see. Quant is just starting off, and excuse me if you thought I was being too loud. See, you haven’t actually contributed to counter my arguments, apart from using “what ifs”. But if you’re so confident with the percentages you’ve quoted after the “what ifs”, I would advise you to document it properly as a research work, you might make a Nobel Prize out of it. 😀 But on a different note, I hope your forthcoming reports would be lot more meaningful and interesting. Good luck. Whatever little insights i got about my trading behavior using this new tool was definitely useful and again thank you zerodha for this. So please keep it coming. @Santosh – At the very least someone on this Earth is trying to something to help his clients. What have you done ? If you are so called extra “smart” why not design and launch a better product ? May be then Nithin will listen to you. Until then use it or leave it! May be Nitin has not yet won Nobel Prize but have you even won Bharat Ratna for your smartness ? BTW is your IQ even been nominated ? Or why not you start another brokerage and impress us ? although i have not yet tested the Q. but the idea is no doubt wonderful. thanks zerodha. We are making some changes, should be up soon. Good initiative from Zerodha… My question is with regards to the granularity of data for time based analytics, Is it possible to drill the data down to the time (hh:mm) of day when one makes profit or loss? It will be very tough to go to mm, but yeah hh is planned. So you can see your performance in the last 1 hour or first 1 hour of the day. Should be available in the next couple of months. Zerodha! once again have exceeded our expectations. Such products from a discounted brokerage was an unthinkable past. Just a suggestion, apart from time analytics, if you could also include stock specific analsis it would be great. For example, which script has given me consistent profit and vice versa and also the sector where I’ve gained and lost. Looking for more such features. Currently while these reports seem attractive initially, beyond that, they dont add any value as i cannot infer anything meaningful from this…. Should you need any data points, i can mail to your team. Time based analytics is based on when you enter the trade. So for example, if you bought Nifty futures on monday and sold it on thursday for profit. The profit is added for monday, because this analytic is used to tell the best time to enter the trade. But I have already emailed you, we are double checking and will get back to you soon. Hello Zerodha, I am a prospective convert to Zerodha, I am currently using other trading platforms. The key thing i am looking for is a superior trading platform and i have been very impressed by what i am reading/hearing about “PI” and other supporting tools such as Quant. 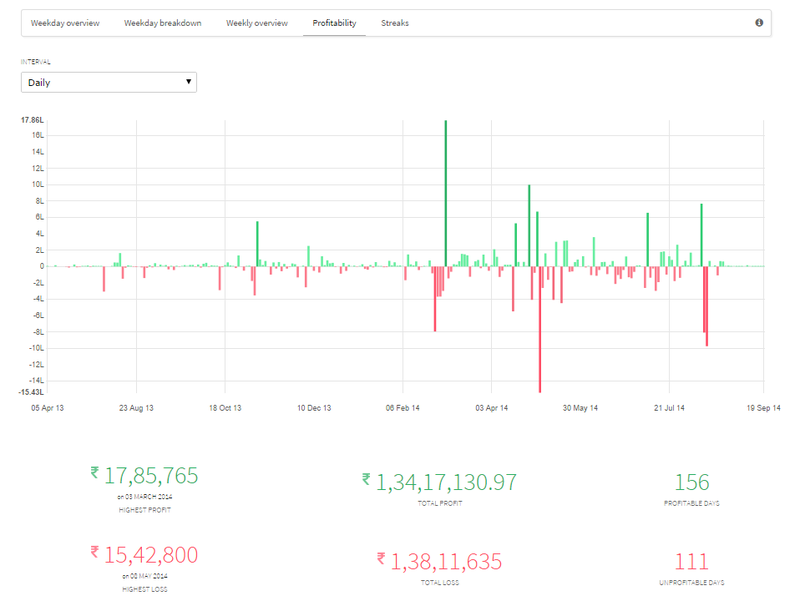 Analytics is a key component of a traders success and am glad Zerodha is doing what it can in that space…..My specific question today is does any of Zerodha’s platforms currently allow for a “cash linked Future order”….I.e. will I be able to put in a pre-market order that says if Nifty or any stock touches a particular price, immediately buy a future of Nifty or the stock. Simply put, instead of buying in equity segment at a particular price, i want to trigger a futures order at a cash price trigger. If not currently available, does the new platform have this feature? This is an important feature for a futures trader and i know only of IB that provides this feature. It would be a key differentiator. Prashant, one trigger other is something that we will have on Pi in the future. This will take some time though. we are too excited about pi, and eagerly waiting for this tool, when will this be released ? Ajay, we have around 200 users beta testing it, we should go live soon. how long more will it take? can we expect it for sure in October? Now Zerodha terminal is have some problem especially if u r login in different time zone countries…we cant get chart update after certain time…Is that problem solved in PI ??? Yes there are scanners available, but don’t know if it will work like what is on Ami. Once you test Pi out, let us know if you face any issues, we can have that fixed. Not for now, we have 80+indicators, we will add more after the launch. Can we download this to excel or csv format? That will still help us further more to derive calculation offline. Kindly provide this info. Thanks. No. If you want to download, you can go to Q and easily download both the P&L and tradebook in excel. I am a user of zerodha trading platform since august this year.My quant was last synced on 01 october 2014 and the latest data in the quant available till 22 october 2014. Since 22 Oct I have made 10 trades till 4 nov 2014, however the data is not updating in the quant. I wrote to admin on friday received no ans. Any issue with the software or is this a localised issue. Quant helps me take informed decision , so pls solve my issue quickly. Moumita, can you send an email to [email protected] with [email protected] in cc. Mention your client ID, should not happen. I am not able to see any report in quant… Since last 3 days, I get message that “Wait until we fetch your data” !!! Anil, can you send an email to [email protected] with your client ID. This has been reported to our developers. I think you should be able to see accurate information by end of day today. I have been a client of Zerodha for the past 2 years. Although, not a great player, feeling extremely happy with your technical service and innovations.Thank you and All the best for your future venture ! Quant has suddenly developed some strange glitch. My realised Profit is suddenly displayed as a wholly inaccurate figure because since day before yesterday it has started recording my buy price for SBI Nov futures as 368.30 (It has not traded anywhere near those levels and my actual average was obviously much lower). I just realized it has not adjusted prices or quantities post the stock-split of SBIN, can this defect be corrected, it started occurring only day before yesterday, but it’s highly confusing. Prabhat, we fixed this issue of splits on Q P&L, we will fix it for Quant also asap. Hi, unfortunately, this problem with the splits is still there on the Q P&L. Having our team check this, we will send you an email. Yes, the final beta release tomorrow onwards. We are releasing it to a few, and then will slowly keep increasing over the next week. (a) Profitability should be first report in time basd quant. Every thing else flows out of that. (b) Profitability data (displayed below graph) can be better presented in tabulated manner. Same is true for all other data displayed below graphs. (c) Streaks can be neatly displayed in tabulated manner alongwith profitability data. (d) Week days Breakdown – Weeks (Green Rectangle) is not relevant to week dyas breakdonwn and is already covered in Profitability > Weekly. Will be posting my comments on Trends and Cotract based quant views subsequently. a. Profitability-weekly, is visually showing your profitability(P&L statement) over the last 1 year + in terms of week. So Oct 1st week,2nd week, Nov 1st week, 2nd week etc. b. Weekly overview shows which week of the month (1st, 2nd, etc) overall have you been profitable. As in, your average P&L over the last 1 + year to see if there is any pattern in you making money say 1st week of the month or last. Thanks for clarification …. you may consider providing ‘weekly breakdown’ months wise (just the way you have ‘weekday breakdown’ weekwise for ‘weekday overview’). Hi, I am not sure if this is the right place to ask/comment, but I just installed PI (Absolutely excellent, and very intuitive trading platform), but I have a request. Is it possible for Q or PI to have an option where records for the same contract in different months are integrated. For position traders who roll their positions over, it is easier if we don’t have to manually add and subtract the same contract for Nov, Dec, Jan etc. Unfortunately, I am getting inaccurate displays there. I can show screenshots to the technical team if needed, the P/L on Q is perfectly accurate, but the Contract Wise display is extremely inaccurate for some contracts. How can trust these reports ??? Prabhat, will get our tech team to call you up. Thank you for being so prompt, I really appreciate the excellent customer service. It’s nothing particularly urgent though, so it’s fine if you guys take your time on this one. First of all would like appreciate you for just a great tool to figure out profit and losses however there is some problem in profitability on daily wise Just i was checking and trying to get the daily profitability record what i found some of days profit and losses and not there or missing. so could take this forward and i have already raised two – three time support ticket but there is no response from them. I have found some issues with price alert in Zerodha trader. I have logged a ticket #113304 . But still I could not get the solution from your support team. Finally I have reported to the issue to Omnesys technologies also. Please go though it and expedite the solution to the problem. i forget password of pi how can i recover it? You can reset it yourself by clicking on forgot the password. 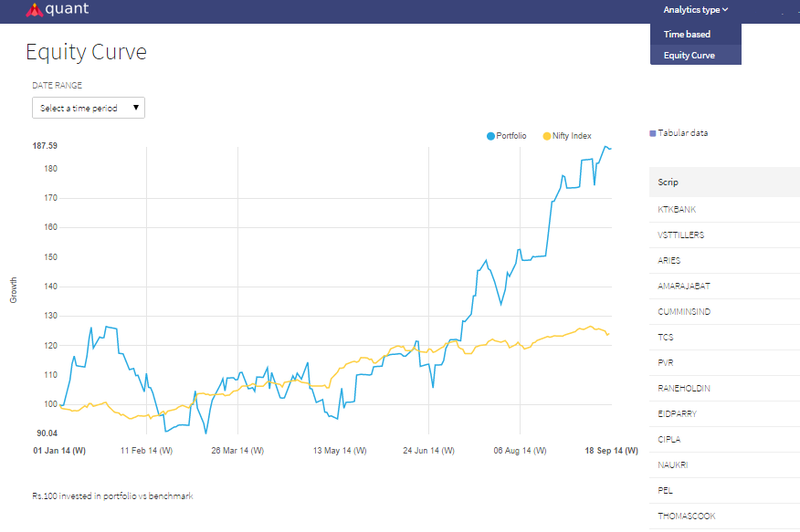 Sabir, we probably have the best web based charting platform in India on Kite. http://zerodha.com/z-connect/tradezerodha/kite/kite-introduction. No, we don’t have any fixed monthly brokerage chart. I am a losing trader since 10 years. But the happiest fact is that the applications which you guys are providing is simply amazing. I love PI, then the Kite and then the quant. You guys rock. These are very powerful tools. 1. In PI, I cannot have both RSI and EMA of RSI working on hourly chart specially on commodity charts of CRUDE and NATURAL GAS. Can you get this rectified? 2. In Quant, when you show analytics of by buy/sell on chart, can you please sort the buy and sell signal based on time? As of today it does not differentiate between long and short. I am a very tech savvy person and very happy that I chose Zerodha. I would not only use your service for long time but recommend to my friends. My Client ID is DH0569. You or your team can call me if you need further clarification. Every things are well and nice. I request you to have the font color in dark color . So that we can read content with out strain. and request make the images legible so that we can see the image well. We are working on a new version of Q/Quant, will put this up to our design team. :), yes on our list to do. I am account holder with Zerodha and have one suggestion….for equity trading…. Please ammend your software to include auto SIP in equity. ie. I want to buy 10 RIL shares 10th date of every month. Please advise and also kindly send me mail on fiven email ID. It is on our list of things to do. Will take some time. Their are some serious issues with Q,All the figures shown are ramdom and not related to my trading activities.For example its showing my profit till date is 58 crore and my 60 day challenge is -8 lakh.Many more such examples.Kindly rectify the errors. Also their are issues with accounting of weekly bank nifty options.I see that funds post expiry are not added properly to the account funds.I have raised a ticket on this as well, but no response yet. Vinit, there was some issue with Banknifty weekly options recently introduced. Having this checked. I have been member of Zerodha since Feb 2014. I am having best support every time from Zerodha Team. Thanks for launching great tools like Zerodha pi, Q, Quant etc. Equity curve in Quant is not showing result/graph until current date. It always takes 27th Dec 2015 as last date no matter which option I chose. Any fix for this? Equity curve option is currently down. We will have it fixed soon. Thanks.. I meant not only now. It always showed only till Dec 27th 2015, no matter what I selected. Yes, there are some issues with equity curve. It is buggy, we will have it removed until we introduce it again. The quant analysis tools are best tools so far seen in markets. But its only on papers. But past some days the Quant analysis tools are not working. Data are not updated. My friends who opened there accounts on Zerodha also found the quant tools not working. They were unsatisfied by first look. So asking to please fix these problem. If the problems fixing is in progress, please put up the some message like “data are not reliable, issues being rectified” in front page. Guys, I have opened a new account with Zerodha (though I am not new to market). I heard alot of zeroadha, also you got award recently at ET bootcamp. But looking at some silly thing, I force to write about it. why your quant service is down, even though it is down why don’t you put some message there. I don’t it is big deal to do that. I am sure it is not your engg can’t do that, it is your management who can’t think about impact due to this on your branding which started on right foot but could not maintain it . Rather giving focus on expanding business, fix running business. Or don’t give service which you can’t maintain. My quant is not showing recent days data. I.e. after march this year. So please resolve this. is the Market Trends report working in Quant, i am not seeing any results . please check and advice. Is there any browser mandatory for quant or any minimum time period is required. Hats off to you for these type of inventions in indian market, Please continue it irrespective of useless comments & demotion by some pepole. I am big fan of yours for these type inventions. Those whose are not able to understand these things let them to dip in sea of heavy brokerage charges. my Q-backoffice analytics are not updated and this is happening second time. Earlier I have also complained on this issue. it does not get updated regularly. Time analysis reports are not getting updated in Q-Back office. Can you please write to [email protected]? Our support staff will be happy to help. these features are not working in my account. Earlier I used to see all these but from a month or so, nothing is visible. All values it shows as zeros, and no charts no statistics are visible. It says no data to display. Whom to contact, can you give an email if your technical or support team?? i m facing problem particularly in time based features.always i have to mail to support team for fixing the issue.today again i have mailed for the same. earlier it was smooth now at regular interval i used to mail back office guys to solve. We are adding a sync button on quant, you can do this yourself from now. I can see the sync button in quant , but even after pressing sync the data is not updated. quant data is not updated from past 1 month for me. please solve the issues requarding quant data synchronization. Feature not working. everytime I want to check Time based analytics and other things it shows results, ‘Data not found”. this bug need to be fixed. “No data available” what is this? everytime I want to check Time based analytics and other things it shows results, “No data available”. whether my investment data not with you? Please write to [email protected] and one of our support staffs will sort this out for you. Please write to [email protected] from your registered email id. We have given a sync button, you can click on it to update. Sync not working for me. While Time Analytics is a cool feature to view the profit and loss pattern, it does not take into account the profit and loss after brokerage and other tax related charges. This can be extremely misleading. For instance, Time Analytics show that I made continuous profits for two weeks, while in reality I lost Rs 650 due to trading charges two days in a row in the same week. I wish Time Analytics and all other analytics take this brokerage and tax charges into consideration for displaying analytics. Also, there is no way of knowing the total cost of my transactions (buy and sell) unless the next day (Kite does not update P&L even at 11:40 PM – 10 mins after close of commodity trading hours). While Zerodha provides a brokerage calculator, it is not very effective if you are dealing with a large number of trades. Suggestion: Provide a display of estimated charges based on the last trade executed. The key word here is “estimated”. I understand that it is not possible to display real-time actual charges until close of trading day, but an estimate would be a big help. Joey, we are in the verge of launching our new reporting tool, which is going to be much more cooler that the current version. It will have all that you are asking for. Brokerage at zerodha is actually as simple as it gets. It is Rs 0 if you are investing, it is Rs 20 per trade if you are trading futures and options. Except Stamp charges, everything should match. You can send an email to [email protected] if you’re having any queries specific to your account. quant not updating since january. sync button never works. can you please let us know when this will be fixed. I am not able to sync my quant data…..
“Sync” button on quants is not working for anyone. Could you or Venu please follow up with technical team to fix it asap. Individually i have mailed this to [email protected] with my client ID but when i checked with my friends they all are also facing the same issue since Dec, 2016. Tried “Sync” many times but it didn’t worked. Also, can you please consider displaying the Nifty spot price on Kite home page. Any help appreciated. Can you email [email protected] with clientID for the sync issue. Once you click on sync, it takes like a day to update. Almost everyone is having sync issues since the beginning of 2017. Its been so long since this issue is being reported by so many users. Considering that Zerodha boasts of the being a top notch technology broker its a little funny that you guys havent been able to fix such a simple issue for the last two months. Kash, we are pulling down Quant until our new reporting platform is out. The current one is built over a vendor based trade process platform, which we are replacing. Hi there is a problem with Sync in quant when will it be rectified!!! We are planning to take down quant until our new backoffice platform is ready. Quant App is not displaying any data for me (user id : ZX4902). Is there any restriction? Sunil, until the new Q is out, we have stopped supporting quant. It will come out in a new avatar soon. I can’t see any data in Quant. Its been 8 months since I have opened my account. Not a single time I am able to see any data in Quant. Do I need to do something else for this? Quant will be down since all of the tech resources are working towards building our in house backoffice, Crux. any expected date for releasing of new house backoffice, Crux? When will be the new backend CRUX be released. Data has been inconsistent for the corporate action related shares, be it in PNL statement or Trading platform. Can you tell us a tentative date on which this will be released ? We’re working on it, most of the bit is done. It’s undergoing the final testing phase and will be released soon. I was told in April , that it might take 2 more months for the release, May and June are done, can we get a tentative date at least, Also there are inconsistencies in backoffice where holding duration sometimes appear and some times dont. This should also be made consistent. Can we expect our data to be consistent in atleast one month from now? New Q should be out in a month, quant will maybe take some more time. Thank you for the update. Eagerly awaiting to welcome the new Q.
I think one month has already passed, new Q is still not out? Again one more month? All our resources are dedicated towards taking Q live, will be up soon. Sorry for the delay. We’ll keep you posted. All Important reports like P and L report, 60 day challenge report are incorrectly generated for me..I had raised ticket for fixing the same but nobody bothered to fix those existing issues. I understand you guys are focusing on bringing up a new backoffice but that should not compromise the quality of existing backoffice Q. This is getting really frustrating for me since I don’t know how much I made or lost in past 2-3 months. Until the new backoffice is live you guys should fix the issues with existing backoffice asap. I have been trading for the past week, i tried to use the quant feature in q but was unable to do so, It displays “No Data available” for any timeframe. I called up zerodha support and the gentlemam there advised me that quant has not been rolled out yet and will begin only by August end. Going through the comments above i think it is already functional in some way. Please Advise. It would be great to reverse the order of display comments/responses – have the latest showing up on top and the oldest at the bottom of the stack. Hello! We’ve currently deprecated Quant as we are working towards bringing the next version of Quant in our new backoffice. We will not be able to sync your data any further and apologize about the inconvenience caused. Thank you for your patience!. Partha, we are in the last leg, roadblocks which we had never expected. It will take us more than a month. Is Quant deprecated? I am not able to view any data in that page. I see a warning message that says Zerodha can not sync the data as they deprecated the Quant. If so, is there any idea to bring any other new analysis tools? We have taken it down for now, we will bring it up in the next 2 months. It would be better if we could get just the portfolio in the form of API, so that we can import the data in Excel or dashboard for further analysis. I know zerodha opened up a personal trader platform with 2000 PM price tag but not all are required for every day analysis. I got the allotment message of 1 lot(60 shares) for Capacite Infraprojects Ltd. But the same is not reflecting in Zerodha account in Holdings tab. I have booked this IPO through SBI using zerodha account number. Hey. I see that you haven’t submitted the Power of Attorney for your account. This being the case, you wouldn’t be able to see any stocks in your demat account on the platform. I suggest you courier the duly signed PoA to us at the earliest. Please let me know what needs to be done now to reflect the holding tab. Please let me know to which address I need to send you the courier. I heard there is a zerodha office in kadubisanhaali. Can I hand over the document in that office? Or I need to do courier to office mentioned in ECN form. Yes, you can submit it at one of our branches, you can find out the nearest one here. I have sent the documents on Thursday (5th October). please let me know by when I will able to see the holding tab listing updated. Nobody is repying now a days. I am waiting for Crux launch. I have added discrepant value for same stock two times. Now I am unable to delete it untill Crux is launched. So I am asking for exact date when it will get launched. Why it is delaying for more than 1 year? Sync button is not working in quant. I tried it for time based & time based analysis , however it does not provide latest data. There are many indices which are not given in Pi trading software. Could you please tell me why is it like that and when you will add those indices in it ? I was told that it will be implemented with the new platform CRUX but I am still waiting for is launch. Can you please inform when will CRUX be launched. For the while please fix the option on Q platform for checking P&L withing specific dates. I was told that it will be implemented with the new platform CRUX but I am still waiting for is launch. Can you please inform when will CRUX be launched. For the while please fix the option on Q platform for checking P&L within specific dates. No update. They just forgot it now. The new Q should be out in a few weeks’ time. I am listening few weeks for last 6 months. Unfortunately, we underestimated the scale of the whole Q project. It has taken us longer than originally anticipated, but we’re close to a breakthrough. Can i know when the Quant will be accessible. It has been years now, listening in a week’s time it will be accessible. Let’s see how close it is. My friend transfer stock in my account since 5 days. But still i didnt get in my account . Can you write to support[at]zerodha.com with details? Account specific queries like this are best sent to support. Sachin, we’ve indeed deprecated Quant for the time being. Should be back up with improvements in the new Q. Same is the case with me. When will you update? can you please give a rough estimate? 1. I have referred 5 persons 4 have joined (within 60 days) but in Q its showing only 2 persons joined yet.?? 2. My referral doing intraday trading but referral commission deposited to my wallet is very much less then expected with respect to his trades. Pl resolve both concern, since tried in many ways for solution but hopeless from response.. hope this forum will help me out or else it’s a demotivation act to refer peoples & get not what expected/committed. I am listening same thing for so long that Crux is going to launch soon. Now 31st March is coming nearer and we are also worried about LTCG CALCULATION and still Zerodha is silent. I am not getting any correct data over q.zerodha.com. Nothing synced. No body is really bothering in Zerodha. It’s is like govt dept where every project is always delayed and they never know when it gets finished. Whenever you ask they say “soon”, a simple one letter word to get rid of customers. That’s it. Best of luck Zerodha with your company management and technical team. We request you to provide the NSE and BSE indices at Holdings in KITE mobile verson. When we are watching the Holds we have to know whether the market is going up or down. It is very useful to all pl arrange to activate the above. When are you going to launch crux? I send mail to support regarding CRUX and they replied that it will be operational by the end of March. Still no clue about CRUX, I am starting to believe that I made a mistake by switching to Zerodha. Hey Dheeraj, we have indeed switched to Crux for most of the backend calculations. Crux is the name of the engine that runs in the background. The application you see will remain more or less the same, but the values will come from Crux. 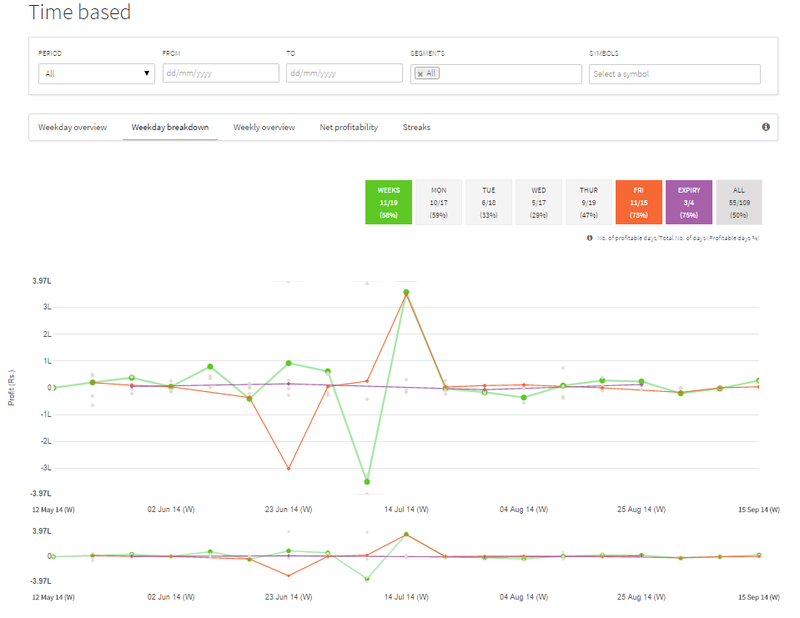 i was thinking that new crux backoffice would have trading journal..and my day to day , week by week, year by year trade details in graphical form, would it be there when you launch new backoffice version ? Hey Vikas, building a trading journal will take time and it’s on our list of things to offer. It won’t be part of our new backoffice at least in the initial versions. I am not seeing Tata steel avg price in my portfolio.they are saying it will take 15 days to launch crus. Then it will be okay and you will see the avg pice correctly. I don’t think crux will actually be launched for customers. Is it? Is it really going to be happen? Many of my stocks’ average buy prices are messed up, also even when I have not received any bonus shares the system is showing me lot of discrepant quantities. When checked with Zerodha support they confirmed that there is some issue ongoing with their backoffice system & these issues will be resolved when the new backoffice system CRUX comes online. Does anyone here know when the CRUX will be available to customers? Hey Saurabh, I seem to have missed your comment. Sorry about that! Our new backoffice, Console, is now live. You can access it here. Please check it out. You can submit your feedback here, if you spot any issues. I can login to the portal but portal shows me data about only the scripts that I have added this month or in the last month. Prices for my holdings from past one year are all messed up on current portal and new portal has no data about those scripts. On the new portal it shows me bunch of discrepant quantities for lots of old stocks & for those stocks I have no discrepant holdings that I need to manually enter. My average prices are still wrong. So, the new portal is just showing the same information as the old one with different layout ! Can you please help fix this for me? I have #20180810111119 open on your support portal for this. Also, is this new app you mentioned a replacement for Q? I heard there is a new back office system called CRUX? Can you share link to CRUX? My mis calculated average problem is back office reconciliation problem. @Nithin Kamath , HELP NEEDED PLEASE. Its petty that I need to come to social forum to ask help on my open ticket ! All my P&L is messed up and showing wrong which is stopping me from buying or selling anything. I am an inch away from switching to another broker. I heard that many people are facing this problem. Why Zerodha is not sending some responsible communication out to everyone?